We, the Muslim parliamentarians wish to bring to your Excellency’s kind attention the continued hate campaign, intimidation and threats to Muslims, carried out by some Buddhist extremist elements of the Bodu Bala Sena (BBS), Sihala Ravaya and Ravana Balakaya organizations.These groups have been targeting Muslim places of worship, Halal food, the Muslim attire and now the resettlement of the Muslim lOPs who were expelled by the LTIE in 1990 in the worst act of ethnic cleansing in the history of our nation. Your Excellency, these Muslim lOPs were labeled as “old lOPs” and did not even benefit from the resettlement scheme implemented by the Government and International Agencies including the cash grants provided by the UNHCR. distribution through the Divisional Secretariat and the Presidential Task Force for resettlement. The Bodu Bala Sena and some sections of the media are highlighting this resettlement now as illegal, stating that they have encroached the Wilpattu Nat ional Park. 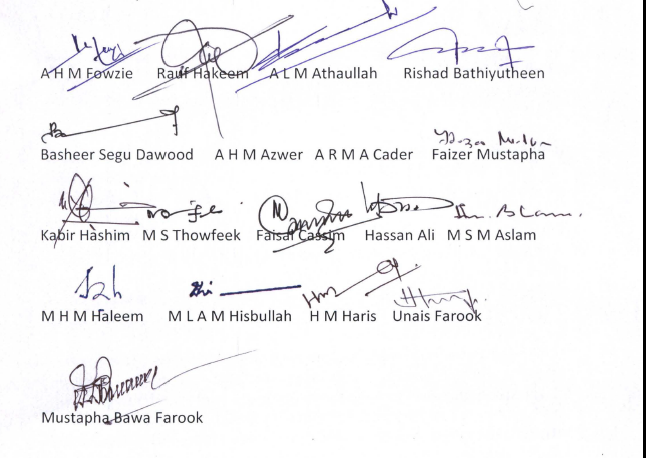 We the undersigned kindly request Your Excellency’s immediate intervention to stop the harassment of these lOPs who have lived in different parts of the of the country as refugees and as a ‘Forgotten’ people over the last 23 years. We thank Your Excellency for your kind intervention. So AZWER and CADER didn’t sign it. There is a RANKING of Muslim MPs. How to have unity when some say killing to protect Islam is good ? Little mistake in interpretation will then bring death penalty. On the other hand if these people become united, they will then kill people of all other religions – bloody disaster to the world , bloody good kamma to Muslims ! Have an election and see. Even a mossie brick will win. Brotherhood comes first. It is all to fool the Sinhalese and Tamils. They are very very gullible. They know it. So why not exploit it. They know the UPFA and UnPatriotic Party both want their support. So one group joins UnPatriotic Party (UNP), the other UPFA. Win win situation for the mossies. Why they become hate figures? They themselves to be blamed. List is endless. Still trying to blame others for them becoming hate figures. Typical mossies. Crafty to the core. Menace to any country. Stop multiplying xxxxxxx xxxxx!